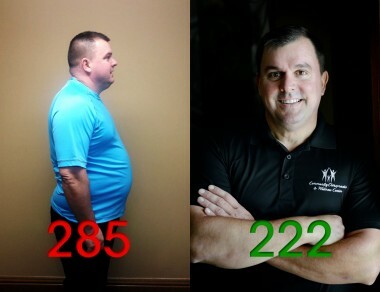 For those of you who follow our blog, you may remember at the beginning of 2013 Dr. Waggoner set a goal to lose 90 pounds of unwanted weight. After years of similar new year’s resolutions that ended after a few months only to gain the weight back, this was the year he was going to do it the right way; with healthy eating, proper portions, and exercise. He had tried the fad diets, and learned from his experiences that although they did at times allow him to lose weight, it wasn’t the means to long term health. You can only achieve that through a lifestyle of healthy eating and exercise. Consistency in both of these areas will bring with it consistent results! If anyone else is selling you something else, they don’t have your best interest in mind. We all know that eating fresh fruits and vegetables is one of the best things we can do for our bodies. Did you know that organic fruits & vegetables are available throughout Elkhart and Lagrange counties by local farmers? My wife Juli and I buy a regular share of produce each year from Farmstead Foods; a division of Pleasant Ridge Organic Farms. The cost for a regular share of produce this year is $280 and a Large share $495. If paid before March 10th, a $20 dollar discount is given. The harvest usually lasts from June – September (16-18 weeks) and includes whatever is in season at the time. We have really enjoyed going together as a family to pick up the produce. The Farmwald family are Amish, and just love showing our daughter Anna the Blue Bird houses and other farm animals. They also have a BBQ cookout with all the families to kick off the season. For more information you can stop by our office to pick up a flier or contact Delbert Farmwald at 4055 N 1150 W Shipshewana, IN 46565. Fad diets, shakes, biggest loser, diet pills, multilevel marketing products… I hate to admit it, but I’ve tried them all. Yes, I had some moderate success while on a few of the programs only to gain the weight back with additional weight. Most people that try these approaches have a similar experience.